Our metabolic health crisis—as defined by the conjoined endemics of heart disease, diabetes, high cholesterol, and obesity—continues to surprise biomedical researchers, frustrate health experts, and disable and harm millions of people. This week, three news stories illuminate yet again how the most important challenge that the metabolic health crisis presents is not biomedical or scientific, it is political. A political framing of metabolism matters because how we frame and interpret unjust and harmful situations shapes our options for insurrection against those situations. The extraordinary plasticity of a body’s metabolism was a surprise for these obesity researchers and it certainly raises questions about how overweight people should go about achieving what are thought to be “healthy weights.” Yet, the biomedical claim that an overweight body is always an unhealthy body is more contentious than productions like The Biggest Loser would suggest. Scholars have interpreted the obesity problem as a socially induced moral panic that pathologizes overweight bodies and targets them for constant biomedical intervention and ethical judgment. Treating metabolism as an individual biomedical problem makes it more difficult to diagnose the metabolic health crisis as a social and political problem that impacts entire populations of organisms in patterned ways. This biomedical finding may also prove disheartening for millions of overweight people who struggle to lose weight and keep it off. As Kolata says, “Despite spending billions of dollars on weight-loss drugs and dieting programs, even the most motivated are working against their own biology.” In this conceptualization, the body’s metabolism acts as an agent, conspiring against us to produce embodiments that we don’t want. Equally disheartening, in my view, is the narrow way in which metabolism is constructed as a biomedical process found only in the body and its biochemicals (for example, Kolata features the hormone leptin). In contrast to interpreting metabolism at the level of an individual body, obesity researchers would be wise to incorporate a concept of social metabolism into their theoretical world. The bodies featured on The Biggest Loser don’t exist in a sociological vacuum—they exist within a corporate food regime that makes it next to impossible to eat well in order to be healthy and a corporate pharmaceutical regime that crowds out alternative modes of healing bodies. All too often, the companies that produce and regulate food and drugs in our society are seen as bit actors in the grand play of social metabolism rather than as occupying the leading roles. This leads me to a second story, which digs into the ways that government regulatory practices shape population and ecological health. The Guardian reports that lobbyists for the United Egg Producers, the National Cattleman’s Beef Association, and the National Pork Producers Council are urging Congress to soften Freedom of Information Act laws that force the government to report when the food industry lobbies the United States Department of Agriculture in the form of financing for “checkoff” programs—the sort that are responsible for marketing campaigns like “Beef. It’s What’s for Dinner.” The bill containing this regulatory change is merely proposed at this point, but it signals an ongoing dynamic in which food industries seek to obscure their involvements in shaping government policies that structure our food environment. These companies are able to produce low-cost, industrially manufactured animal products because of vast government subsidies given to other agribusiness that produce corn and soy—two key ingredients in animal feed. These covert actions work to conceal the political problem posed by metabolism and make it hard to resist government regulatory practices that shape population and ecological health. As long as individual bodies remain the target of metabolic intervention (like the highly visible bodies on The Biggest Loser) and not corporations, we are in deep, deep trouble. But, there is room for hope. A third story cuts against the historical grain created by the biopolitics of metabolism, this one involving the colonial manufacture of sugar in Hawaii. As reported first in January and again in April, the Hawaiian Corporate and Sugar Company has planted its last sugar crop on the island of Maui. This 144-year old vestige of the old colonial sugar production system has determined that it is no longer profitable to use its stolen land for sugar monoculture and instead intends to diversify farming operations into new commodities like sorghum, fruits, and bio-mass. Native Hawaiian activist Tiare Lawrence has called for the land to be returned to the people of Maui so that more sustainable agricultural practices can be implemented like family-scale organic farming and agroforestry. Given the role that sugar plays in the ongoing metabolic crises, both at the level of individual biology and social ecology, this development in Maui signals possibilities for what can take place when institutions that produce inequality are (at least potentially) dismantled and replaced by locally organized social systems that aim to benefit the common people. These seemingly disparate stories are connected through profound political transformations that link biomedicine and agriculture together. These developments illuminate the biopolitics of metabolism, a term that encompasses the ideas, social practices, and institutional relationships that govern the metabolic health of individuals and groups. In the biopolitics of metabolism, we essentially have a political problem that gets dressed up as a scientific problem, but we have to recognize that the scientific is always a political problem. The convergence of the individualization of metabolism and the concealment of the social dimensions of metabolism have created a context in which solutions to metabolic crises are increasingly understood as a problem of either more technocientific medicine or more transparent government regulations. But, these two pathways have always worked together as mechanisms of biosocial control. Perhaps we should start crafting new political stories about metabolism that help to break this pattern of understanding. 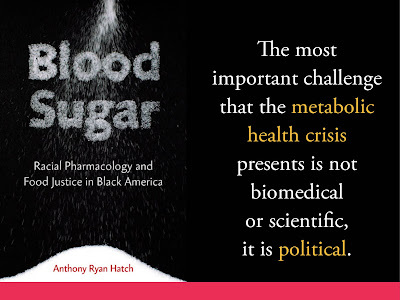 Anthony Ryan Hatch is author of Blood Sugar: Racial Pharmacology and Food Justice in Black America. He is assistant professor in the Science and Society Program at Wesleyan University. "Bearing personal witness from the frontiers of the quantified self, Anthony Ryan Hatch offers a reimagining of metabolism as a form of social knowledge. 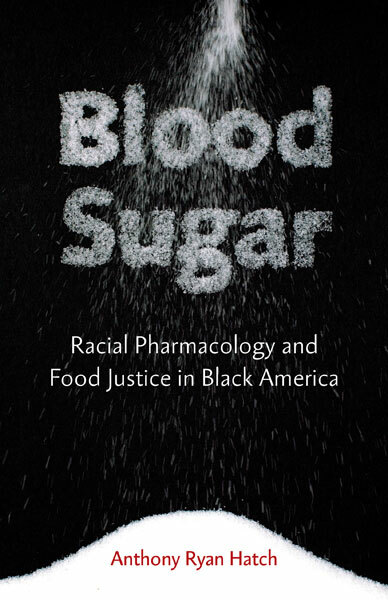 Blood Sugar makes a key contribution to our understanding of the evolution of racial health disparities." Anthony, I appreciate you man for this helpful writing with some valuable information. I was a student of Wesleyan University from 2010. Love you, sir. Have a good life.